Our trip is over and I find the time and energy to write a final entry. A small group of us spent six intense days working together. Many of us did not know each other, but we came together, formed a tight knit group, and worked well as a team. All of our days were very long, leaving the hotel at 6:45 am and not returning until about 8:00 pm that evening. Who at home could work twelve to fourteen hour shifts six days straight? Not me 🙂 Above is the line of patients waiting to be screened on our first day at the hospital. I do not have the actual numbers of patients screened but more showed then anticipated. The day was very hot and humid. People waited very patiently and the children were well behaved. No tears or misbehaving on their part, their need for treatment was very obvious and well appreciated. As you can see above, our Honduras OR is very similar to our OR rooms at home. The equipment is a bit older, but so are the volunteers on this trip. Some of this equipment was used back in the good old days of our training. There was no problem figuring out how to use it!The electrical wiring was a bit questionable but worked just fine. No power outages this trip! As an OR nurse, it is my job to keep the room running smoothly and keeping all happy. Keeping in touch with your home base was another important part of this team. 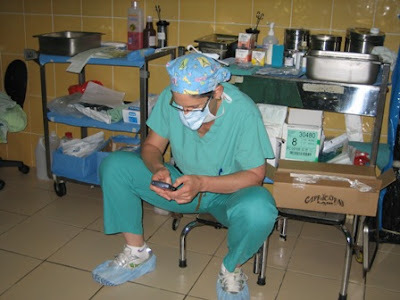 Here is a great image of our Catherine balancing home in Salt Lake with work in the OR on her Blackberry. In closing I would like to thank all the members of this team for a wonderful trip. I will miss you all. This team blended their talents together well and the final numbers should prove this statement. I always wax philosophical as we approach the end of an IVU-Med workshop. So many tragically deformed children treated but oh so many left who are in need. As is so often the case I find that I seem to learn as much as I teach and that the reward I receive personally far outweighs anything that I provide. This trip is very exciting since our local peds surgeons/urologists continue to prove their interest, dedication and thirst for work. 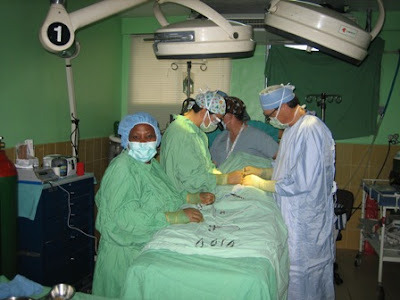 Other than lacking the materials, diagnostic aids and specialized colleagues and nurses their skills are impressive. It must be difficult for them to realize how challenging the lack of funds and hospital support stifles their efforts. The other excitement is the presence of Founder Dr. C. Devries on the mission. I stand in awe of the woman´s brilliance as a physician and visionary who has accomplished great things in a short time. She provides the means for so many to obtain life altering and often life saving care which previously was only a dream. I thank her particularly for giving me and so many others the chance to give back. As one anesthesiologist said in response to the ubiquitous poverty “I wake every day and remind myself that I have won the lottery”. I have begun a campaign to have our founder canonized Saint Catherine of Salt Lake. Sadly me efforts have been unappreciated by the powers that be. How has this trip been? Consider a great group of comrades all energized and tireless, incredible pathology and all day OR time, a tropical environment and the chance to help so many chilren needing our services. What’s not to like!?!? The real currency however comes from the smiling faces of the moms and kids being treated. They consider the presence of IVU a miracle. Thank you St. Catherine. Thanks also th our super Docs and nurses and to our Honduran hosts who always make me feel at home. Lily you are a wonderful childlife resource and have an unlimited potential to achieve greatness. Friday morning. It is the last work day here in San Pedro Sula for the team. I am Catherine deVries, founder of IVUmed. This has been a nostalgic trip for me, since this is the first place that I visited 16 years ago when Interplast’s founder, Don Laub, invited me on a surgical team trip. At that time, I was overwhelmed by everything. The poverty. The smells at the hospital. The long hours standing on our feet at the operating table. The long lines of patients who had traveled for days waiting to be seen. Since then, much has changed here. The local nonprofit that we work with, the Ruth Paz Foundation, has become a highly efficient organization that runs everything from contacting the patients to long-term follow-up. They feed the team, arrange our transportation, and generally run the Honduran side of the show. We now have a team of Honduran surgeons that have developed excellent skills in pediatric urology. They just need a little tune-up on some specialized procedures, which is understandable, considering that in their practices, they cover the full range of pediatric surgical diseases and also practice general pediatrics. They are truly amazing. We have a group of volunteer anesthesiologists as well, and they help us to run the 3rd room. Some things remain the same. The poverty. The exhaustion at the end of the day. And the wonderful sense comraderie between team members. The patients and their families are a great source of good spirit. They are doing well, even after some major operations. Lily keeps the kids entertained with games and art projects. We will be wrapping up the surgery this afternoon, but will stay in touch with the Honduran team by email throughout the year. It is sad to be leaving so soon. It feels like we just arrived and yet we can all feel the intensity of a week of 14 hour days in the OR in our knees and necks. It will be good to take a rest tomorrow. Hi, my name is Lily Morrison. I’m 14 years old, and I’ve never been on an IVUmed trip before. Neither have I ever written a blog. My job on the trip has basically been to keep the patients entertained, and help keep their minds off their surgeries. I’ve met tons amazing people over the last few days, kids who spend days in bed and are in so much pain but hardly complain. And parents who walked for miles in order to bring their kids to a bus to the hospital, and nurses and doctors who work so hard all day. Everyone seems so happy and grateful, despight everything. I brought along with me tons of paper, pens, play doh, crayons, coloring books (thanks to Becky and Virginia), and toy cars. The kids (and parents, too) seem to like everything so far, and can spend hours making things out of playdoh or playing tic-tac-toe. Yesterday I watched a surgery for the first time ever, which was pretty cool. At first I thought I would get woozy or naucios, and Ann even had me sit down just in case. But I didn’t feel sick at all, I just thought it was pretty amazing. Its cool that they can cut you up and then sow you back together, and then you get better. Well, over all Honduras has been an amazing and rewarding experience so far. 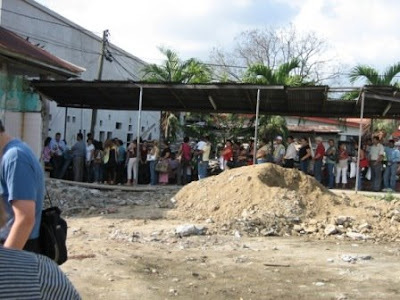 I would like to introduce myself to you before plunging in to writing this blog report of IVUmed’s trip to San Pedro Sula, Honduras. My name is Ann Malcolm Spencer RN and work in a small rural hospital on the Oregon Coast. Our hospital is a 21 bed (not 21 OR suite) hospital that treats a wide variety of patients. Surgery is my love and has been my home for the last 18 years. Traveling with Medical Missions has become my second love, making this trip to Honduras my 11th in the past 6 years. At the present time, 4 of us, Catherine, Lily, Becky and myself sit in the Houston Airport waiting for our 7pm flight to Honduras. I have time to reflect over my reasons of why anyone would want to spend hours in an airport waiting to work over their vacation. I have over heard what others on the plane are going to do on their vacations. Golf and drink tequila in Mexico. Another family is on their way to a cruise in the Caribbean. Basically my reasons are very selfish, my life as been blessed. Blessed with a safe and comfortable childhood. Blessed with good health, great friends, incredible son and a loving husband. I have much to give back in this life and what a better way that to help the children of world. Each trip I swear will be my last but only time will tell. More to come in the following days.